Each year CIFE gives prizes in a range of categories for the best students from CIFE colleges that year. 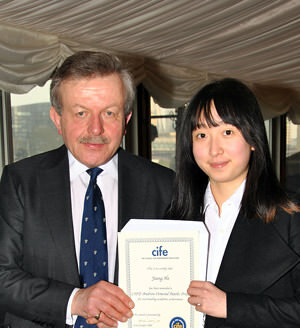 The awards are presented by CIFE President Lord Lexden at a ceremony in the House of Lords. CTC student Jiang He won an Andrew Osmond Prize for excellence in Mathematics. 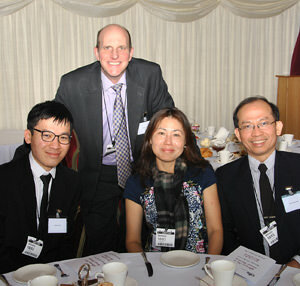 Jiang (pictured right receiving her award from Lord Lexden) joined the college in September 2013 and was recognised almost immediately as having exceptional flair for Maths; she achieved an outstanding score on the Senior Maths challenge in Nov 2013 and was then awarded the best score in her year group in the Senior Kangaroo competition. Jiang was examined in 12 units to earn A* in both Mathematics & Further Mathematics. In ten of these units she was awarded a perfect score of 100, and her final result of 1189 points out of a possible 1200 is one of the highest on record at CTC. She was awarded the CTC prize for Pure Mathematics in recognition of her outstanding results and is now studying Economics at UCL. Zi Koon Pong (shown here with his family and Principal Mark Eagers), was awarded the CTC CIFE College prize for all-round contribution to life at CTC.. Zi Koon joined us in January 2013 with 10 A*s at GCSE. He took four subjects on the 18 month A level course in Mathematics, Further Mathematics, Physics and Chemistry, achieving A*, A*, A* and A.
Zi Koon is an effective leader and showed this during a Duke of Edinburgh training weekend. He took leadership of a group of six and successfully navigated a six hour route march. He also organised a football tournament to raise money for the charity ‘Save the Children’. Zi Koon was also a member of the College Summer Ball organising committee, helped in the publication of the CTC Magazine, been awarded a Bronze Medal in the Physics Olympiad, a Silver medal in the UKMT Senior Maths Challenge and is a good badminton player. Zi Koon is now studying Engineering at Magdalene College, Cambridge.